If you listen to conversations across the US, there seems to be one city at the forefront of the news lately… everyone is talking about Houston. With massive construction projects sprouting up in every direction and a flood of “Newstonians”– yes we had to come up with a term for them– moving to the area daily, it’s easy to see why the Bayou City is getting increased national attention. As a full-time cleaner at the George R. Brown convention center for the past six years, Ana Franco has no benefits, sick pay or vacation, and has seen her salary grow only 18 cents to $8.85 an hour. Despite the region’s booming economy and lowest unemployment in years, many Houstonians are, like Franco, essentially earning the same as they were a year after the Great Recession ended, what experts say is part of a nationwide trend of growing income disparity, according to new U.S. Census data released Thursday. Experts say the data shows the unevenness of the nation’s recovery from the recession. Since it ended more than five years ago, many of the gains in employment, income and wealth haven’t spread throughout the economy. A report last month by Sentier Research, a company led by former Census officials, found the median U.S. household income in June was actually $1,698 less than when the expansion began in June 2009. Those disparities between upper and lower-income earners are being felt quite severely in Houston. As Ms. Franco points out, renters have seen dramatic increases in just a few short years thanks to exploding property taxes. But if your income is not going up to meet the rising rent, it means that you have less money to live on at the end of the month. The other issue that has a direct affect on wages in Texas? The prevalence of low or no-benefits jobs. Even if a low-wage worker can make enough to pay the bills from month to month, what are they supposed to do when they get sick?? Don’t forget that half of all working Texans were uninsured as of 2013, and considering that the state has refused to Expand Medicaid, those numbers have not improved nearly as much as they could when compared to other states. But thankfully in 2014, the working poor of Greater Houston have a real choice in the upcoming state elections. In the races for Governor and Lieutenant Governor, both Democratic candidates Wendy Davis and Leticia Van de Putte support raising the minimum wage for the state of Texas, while their Republican opponents Greg Abbott and Dan Patrick remain staunchly opposed. 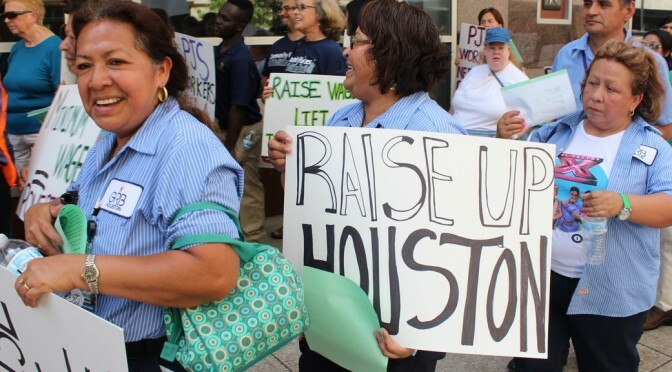 Houstonians have the power to vote for higher wages this November. If enough people show up at the polls, Houston and Texas won’t have to settle for being left behind anymore.